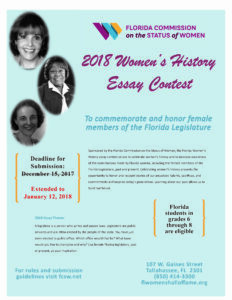 Tallahassee, FL (Updated December 7, 2017) — The Florida Commission on the Status of Women is seeking entries for the 2018 Women’s History Essay Contest from students in grades 6–8. The Commission invites students to participate in order to gain a more relevant appreciation of women’s roles in history. Winning essayists will be awarded prizes and recognized at a special ceremony at the 5th Annual Women’s Legislative Summit to be held at the Capitol in Tallahassee in February 2018. 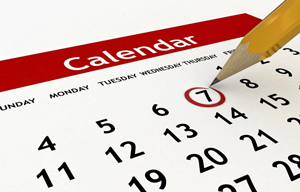 All winners’ names will be released to the media and published on the Commission’s website. The deadline for entry is December 15, 2017. Good news! In order to accommodate the challenging schedule posed on Florida by the storms of this Fall, the Florida Commission on the Status of Women has extended the deadline for the 2018 Essay Contest to Friday, January 12, 2018. It is the desire of the Commission for all Florida Middle School students to have the opportunity to participate.